What is 11 feet long and 4 feet wide and covered with ancient concentric circles, crosses and other patterns? The massive petroglyph at Reinhardt University! This 5 ton boulder was donated to Reinhardt by members of the Cline family in the 1940s. This ancient and mysterious carved rock was found years ago on the Cline farm in the Hickory Log area of Cherokee County near the Etowah River. It was brought to the campus on a large wrecker and placed between two big oak trees nest to Dobbs Hall. It was later moved into the Reinhardt library and then to the Funk Heritage Center where it is now the centerpiece of the Hall of Ancients. This rock was one of a group of three slabs. According to historians, because of a mistaken belief that Native Americans buried gold under rocks with petroglyphs, the other two slabs were dynamited by people hoping to get rich. Petroglyphs, or rock art, are ancient symbols and drawings carved into rocks by Native Americans. The carvings consist of concentric circles, crosses, curved lines and other symbols. Janni Loubser, an archaeologist with New South Associates in Stone Mountain, Georgia, is an expert on petroglyphs. He said, "We know Indians did these things. This is based on archaeological evidence. With absolute certainty, some things on this boulder are 1,000 years old or more." Mr. Loubser said that rock dust, which resulted from digging into the stone, was ingested for luck on hunting trips, fertility in women and for spiritual powers. The Indians believed they received power from the powder. What do the carvings mean? There are many different theories. The full meaning of the rock art is still a mystery. In 2011, Examinor.com published "New Evidence Links Early Bronze Age Ireland to the Southeastern United States." The article mentions the Reinhardt petroglyph and the similarities to the petroglyphic boulders found in western Ireland. Anthony Weir of Northern Ireland has spent decades documenting and photographing the Ireland petroglyphs. One of his photos shows rocks that are almost identical to the petroglyphs in Georgia. A boulder on the Dingle Peninsula of County Kerry has the same glyphs as the Reinhardt bolder. The article continues, "The Creek Indians lived in Georgia for at least 2,200 years. Their ancestors built the state’s famous mounds." 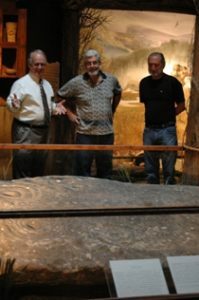 It also indicates the Yuchi Indians probably lived in Georgia at least several hundred years longer than the Creeks, and concentric circles were part of their artistic tradition. A National Geographic television program revealed the use of concentric circles as symbols of Bronze Age Spain. So, this recent story about the petroglyph raises more questions about the Reinhardt Rock than it answers. Those answers will come eventually from the study of archaeology, but meanwhile, the circles will fuel additional speculation about their meaning and why the Native Americans carved them into rocks.